Anthropologie moulinette Souers Scalloped Lace Dress, UK14, GUC. Condition is Used. Dispatched with Royal Mail 2nd Class. 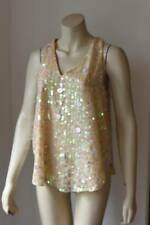 Moulinette Soeurs Party Sequin Top. size 12 BNWT. make Supersized seem small. Lovely sparkly peach coloured jumper which has three quarter length sleeves and a round neck. The fabric consists of a polyester, nylon and acrylic. In a very good used condition and comes from a smoke and pet free home. Anthropologie Body-Hugging Velvet Floral Dress. - Style: Column dress, body-hugging, long sleeves. Skirt is lined to the knee. Waistband is grosgrain ribbon. It is fully lined and the exact fabric composition is 68% viscose, 32% polyester. It should be machine washed. This fabulous blouse features a snazzy multicoloured button print and has button front, 3/4 sleeves with button cuffs, and pleat detail at the top on the front. '13 of 52' Conversations. I have popped a couple of stitches into the v-front split as shown, and also repaired two small seam tears to the cuff. See photos. a STUNNING dress. partly lined up to the knee. Womens Anthropologie Lurex Patterned Long Cardigan Size Medium. Condition is used but like new. Light jersey rib trim to neckline, sleeve cuffs and deep waist hem.Front patch pockets. Dispatched with Royal Mail 2nd Class. Iva Cold Shoulder Dress Pink. size 10 RRP £138. Unique cape-style winter coat from Anthropologie, in great condition. Wool, acrylic, polyester, nylon. Zip closure. Lovely lined dress by Ranna Gill Anthropologie in Size 10. Length, shoulder to hem: 28" on the right, 35" on the left, approx. Pit to pit: 18" approx. Brand new with tags. No defaults. Women's Anthropologie Sheer Applique Yoke Detail Black Blouse Size 8. Condition is used but like new. Anthropologie Feather Bone Oda Dress. the dress has a slight fluffy look, but that's the alpaca and wool content, not a sign of wear! Crochet open knit detail of which the top section is covered over for modesty, and then the bottom is open knit to show the detail of the crochet pattern. Black dress with beautiful white lace, cut out back feature, Anthropologie, size 8. Condition is Used. Dispatched with Royal Mail 2nd Class. The front has small stitched down pleats at the shoulder. Black background with vibrant multi coloured print. Centre front button fastening which goes to just under the collar. Long sleeves ending in a cuff with placket. Model: Granada Halter Maxi Dress. Halter Maxi with tiered hem and v-neck. Floral print. Colour: Pink/Purple/Red/Multi.